The majority of the over 125 active merit badges introduce scouts to skills, careers, and hobbies which have little to do with Scouting. The goal of the merit badge program is to broaden a scout's experience, not just to improve his scouting skills, and that's why we have Coin Collecting, Dentistry, and Truck Transportation merit badges. They allow scouts to take a different path on the Boy Scout trail. But, what about those Scouting Skills? Once a scout reaches First Class, does he stop using those skills he demonstrated to earn rank? In many cases, the answer is 'Yes'. Tying knots, performing first aid, and using a map and compass are not activities that occur very often in the everyday life of a scout. Fortunately, some of the merit badges specifically build on scouting skills so scouts can continue to develop their outdoor abilities. Backpacking - builds on their camping skills and expands from simple weekend campouts. Great to include in Philmont preparation. Camping - promotes more planning and preparation, and requires more camping and cooking experience. Cooking - promotes varied and healthy cooking. A good merit badge for scouts planning their own high adventure trip. First Aid - almost all 'explain' and 'describe' requirements. Completion of the Red Cross Wilderness and Remote First Aid course pretty much covers all the requirements. Hiking - gets scouts out on the trail. I'd say this is the best badge for getting in shape and it's an obvious choice to include in Philmont preparation. Orienteering - great exposure to more map and compass skills, crucial for high adventure treks. Pioneering - additional knots and lashing work, culminating in a full-scale project planned and executed by the scout. Swimming - expands on the First class requirements. A good pre-trek requirement for Sea Base. Weather - helps scouts understand how weather happens so they can be more prepared on adventures. This is one area not really covered in rank advancement. Nature/Bird Study/Mammal Study/Insect Study/Reptile & Amphibian Study - more exposure to the natural world after the 10 animals and plants requirements. 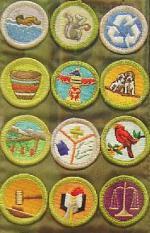 You could encourage scouts to do these merit badges as a way to build the overall skill level in a troop. Creating a Scout Challenge that includes these badges might be a good incentive. Glad to see weather included in your top ten merit badges. As a weather professional, it is frustrating to see people get into dangerous situations due to being unaware of the danger signs. For those interested, there is a concise guide to obtaining this merit badge at www.meritbadge.org. Those are all good merit badges for the scouts to earn, for I have earned 4 out of the 10 and am trying to earn 2 more of those. One merit badge that would be an outstanding badge to earn is Wilderness Survival. That merit badge helps them and is a great one to earn. Thank you for this thought-provoking list. I like how you describe them as a continuation of scout skills training after First Class. As First Aid merit badge (FA MB) counselor I'm not sure that I agree with using the American Red Cross Wilderness and Remote First Aid (ARC WRFA) course as a way to earn the FA MB. First of all, it takes away the scout-directed nature of any merit badge that I find important. Second of all, I envision the ARC WRFA course as additional scout training after he has earned the FA MB. I'd like scouts to continue learning first aid throughout their scouting career (and after). However, I must admit that I'm speaking hypothetically, since I'm not (yet) an ARC WRFA instructor. In addition, in my experience so far scouts do not play a very active learning role for most merit badges, despite the self-directed learning intent of the merit badge program.